The first piece of silverware for the 2017/18 season is up for grabs this Sunday as Arsenal and Manchester City prepare for the Carabao Cup final at Wembley. 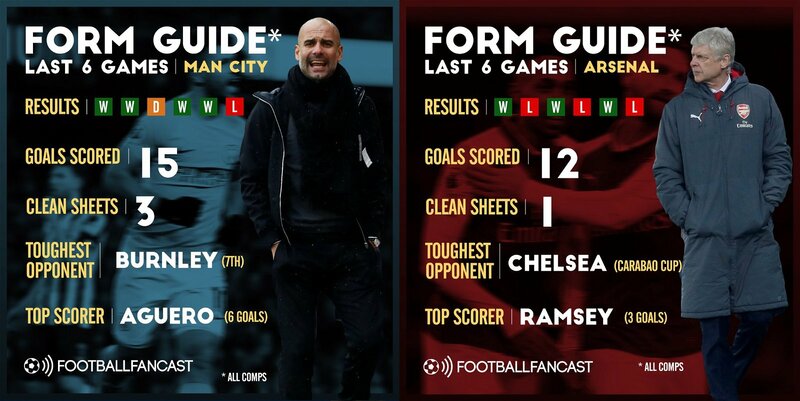 Pep Guardiola’s side inevitably enter the 4.30pm kickoff as the favourites having obliterated almost everything in their path this season, but the Gunners will take comfort from their impressive recent record at the home of English football, and the fact City’s seeming invulnerability took a significant hit on Monday night as third-tier Wigan eliminated them from the FA Cup. Manchester City managed to avoid the Premier League’s big six before encountering Arsenal on Sunday but their route to the final has been far from straight forward. Wins over Championship side Wolves and Leicester City both required penalty shootouts, while Bristol City gave City perhaps the biggest test they’ve had at the Etihad Stadium this season and were essentially only spared a shock exit by stoppage time goals in each leg. Curiously, City are yet to win any Carabao Cup match this season by more than one goal. 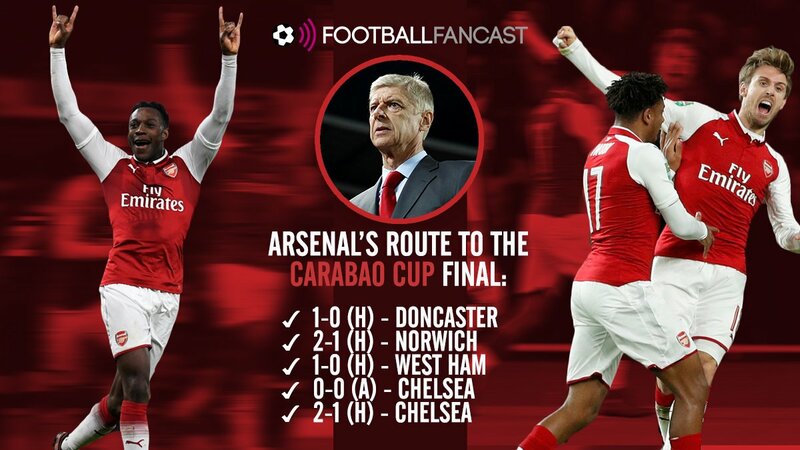 Arsenal’s semi-final double-legger with Chelsea represents the biggest challenge either finalist have faced in the Carabao Cup this season. Both were edgy encounters and the semi-final was essentially settled by two scrappy Arsenal goals at the Emirates Stadium. That being said, Arsenal have also faced the most modest challenge of either finalist – a home tie with League One’s Doncaster. Additionally, while City’s route to the final has involved three away games, the first leg of the semi-final at Stamford Bridge was the Gunners’ only Carabao Cup outing on the road. There’s no doubt Manchester City have produced the more consistent form leading up to Sunday’s final, winning four and drawing one of their last six outings – that draw being at Turf Moor where Burnley always give their opponents a game – while scoring more goals and keeping more clean sheets than the Gunners. However, Sean Dyche’s side represent the toughest opponents City have faced during that time, whereas Arsenal have encountered Chelsea in the Carabao Cup semi-final and Tottenham in the Premier League. Likewise, for whatever doubts might linger over City after losing to Wigan, Arsenal enter the Wembley clash on equally suspect terms having narrowly avoided a shock comeback from Ostersund in the Europa League on Thursday night. 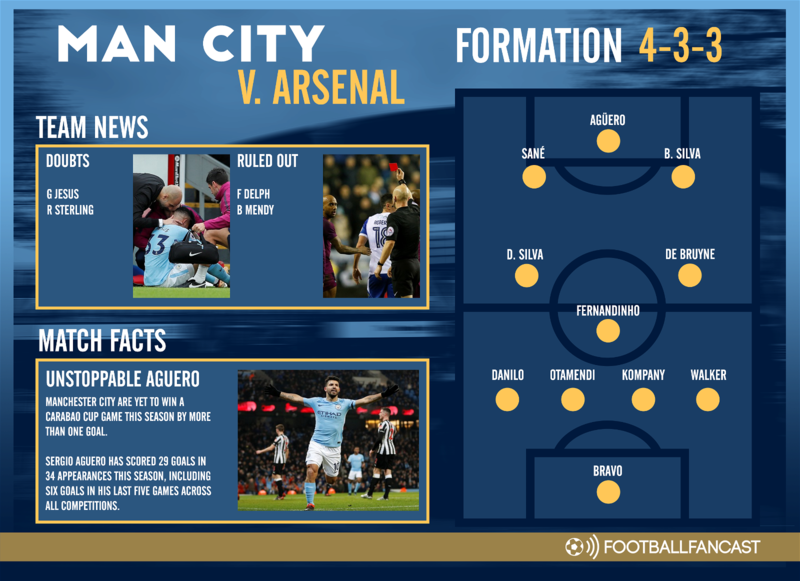 What will concern the Gunners most though, is the form of Sergio Aguero, who has netted six times in City’s last six fixtures, especially in light of the fact Arsenal have managed just one clean sheet during their last six. With Henrikh Mkhitaryan cup-tied for Sunday’s clash, having represented Manchester United in the Carabao Cup earlier this season, Arsene Wenger will have to re-jig his attacking personnel this weekend, although we’re expecting the structure of the team to stay largely the same from the north London derby, with the Gunners deploying three in midfield and Mesut Ozil on the right-hand side. It’s essentially a tossup between Danny Welbeck and Alex Iwobi for the left wing berth, but the latter appears likelier after being taken off early on Thursday night. 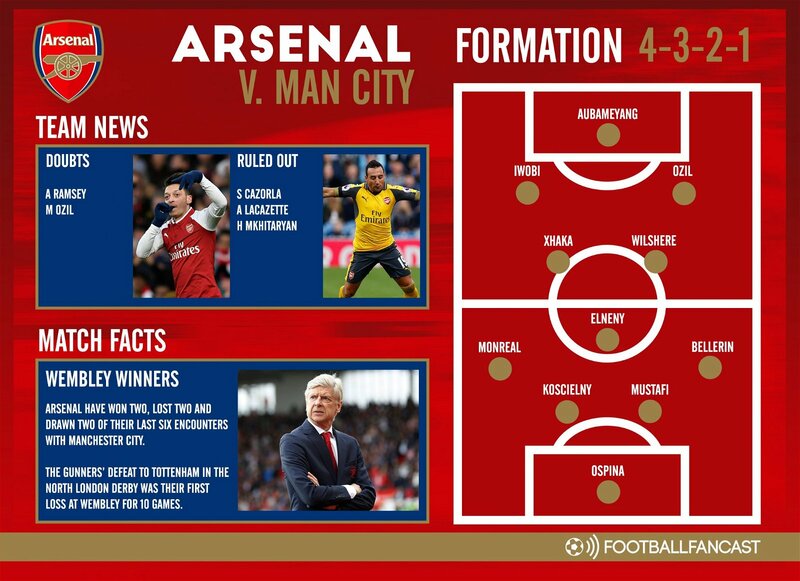 All in all, Arsenal look set to make seven changes from the side that lost to Ostersund, with David Ospina, Jack Wilshere, Hector Bellerin, Mohamed Elneny and Iwobi expected to keep their places in the side despite struggling to impress against the Swiss outfit. While most of Manchester City’s starting XI picks itself at this point in the season, particularly the midfield, there are still a few points of contention. For starters, it’s unclear whether Raheem Sterling has recovered from a muscular problem to start on Sunday and with Guardiola privy to a more than capable alternative in Bernado Silva, it’s likely City won’t risk the England international from the start – he may have to settle for a role from the bench. But the real selection dilemmas for Guardiola come in defence, particularly left-back with Benjamin Mendy still injured and Fabian Delph suspended after being sent off against Wigan. The likelihood is that he’ll opt with the experience of Danilo over Oleksandr Zinchenko’s youthful creativity, and we believe that will be a common theme throughout the backline – with Vincent Kompany and Nicolas Otamendi coming in for John Stones and Aymeric Laporte.